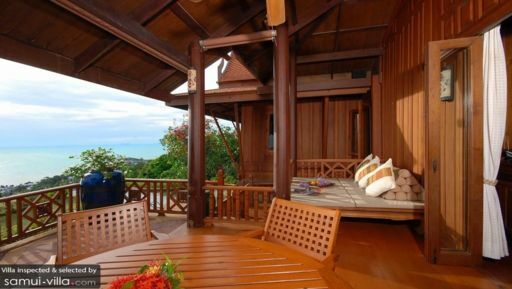 Tassana Pra Villa is a holiday home in Bang Rak Village, overlooking Big Buddha Beach. 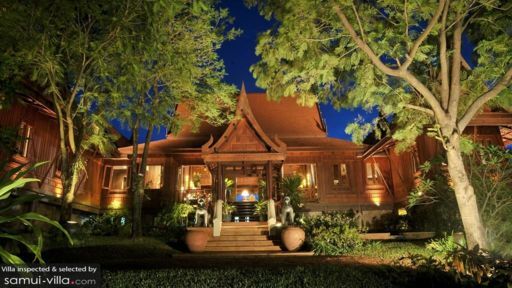 It is a four-bedroom traditional Thai villa with intricate décor that celebrates Thai heritage and authentic Asian structures. 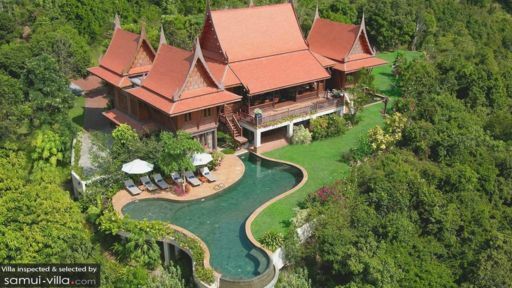 Teak trimmings and trusses are abundant in the villa, and the remarkable villa from the infinity-edge freeform swimming pool is legitimately to die for. As you scan your eyes across acres of lush vegetation and the sea sparkling under the hot, tropical sun, you are sure to feel at peace and at rest in mind, body, and soul. Tassana Pra Villa is home to four splendid bedroom suites furnished with king-sized beds and one room with twin beds. Each bedroom is similarly designed with wooden interiors, luxurious upholstery and drapes, and even more spectacular views of the neighboring areas. The beautiful spaces are conducive for a good night’s rest in your own oasis. There are large windows in the bedrooms to allow for natural, fresh breeze to flood inside. The floors are carpeted with hand-woven fabric, and there are antique tabletops and writing desks as work spaces for guests. Each bedroom is air-conditioned for enjoying a cool and comfortable setting. They even have en-suite bathrooms that are fitted with all the modern amenities and facilities for your convenience. The traditional high-vaulted ceiling and the red brick design sits vibrantly in-between lush greenery that surround the villa. A 15-metre, freeform, swimming pool sits in the middle of manicured lawns and features an infinity-edge that looks outwards to the sea. The stunning landscaping brings out the best of the natural ambiance, as well as the comforts of a holiday home. Kids can play around on the lawns, as adults lounge on the sun chairs place under parasols to keep you in the shade. From the pool, you can also a glimmering Buddha statue, for a meditative and soothing experience. The porch marks the entrance to Tassana Pra Villa, and the wooden exteriors will transport you to an otherworldly place where you can relax, breathe easy and enjoy yourselves with friends and family. The porch is furnished with chairs, sofas, as well as an al fresco dining area. As you step inside through antique doors, the rustic beauty of the villa’s equally gorgeous interiors will surprise you. There are wooden frames on the walls, high-vaulted ceilings and intricately carved wooden hangings as well. You will get a log cabin-esque vibe as you lounge on the comfortable and plush sofas placed in the living area. There is ample lighting both from outdoors and indoors to keep the room illuminated throughout the day. Besides the alfresco dining area, there is another lavish eight-seater dining table in the living area against a mesmerizing backdrop so you can enjoy your scrumptious meal in style. The articulately decorated living area features rich artwork, potted plants, dim lighting for a luxe ambiance, and much more in terms of comfort and ease. A fully-equipped, western kitchen with an equally enviable view of the valley can be found next to the living area. The villa offers you the chance to explore the lay of the land on foot, bicycles, boats, or even cars that you can rent at an extra charge. A daily breakfast is served hot and fresh to make a good start to your day. If there is anything you wish for, the friendly and welcoming staff is all too ready to help you! From the villa, you can head down to the beach to view the glorious 12-foot long Big Buddha statue located on the island. Big Buddha beach is great for spending time with family and friends as it has a laidback and easygoing vibe. Wat Plai Laem is a Buddhist temple where you can go and feed the fish!